By: David Shepherd, News Director / Forecaster STORM TEAM COVERAGE Sponsored by Krempp Lumber Company. ***UPDATE -- The News Blog is no longer active for this event. AREA WIDE -- The first burst of winter weather of the season is already starting to bring a wintry mix. 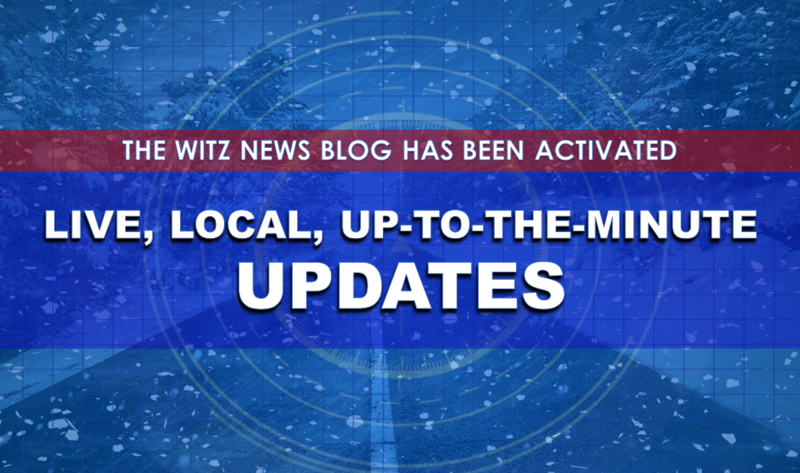 Check back regularly for live updates on the weather forecast and its impacts. We are still expecting less than an inch of snow and up to a tenth of an inch of ice. Roads will get slick. ANOTHER ROUND OF WINTRY PRECIPITATION THIS AFTERNOON AND EVENING... LINGERING FREEZING RAIN AND DRIZZLE WILL SLOWLY TAPER OFF THIS MORNING, ALONG WITH TEMPERATURES RISING JUST ABOVE FREEZING. WATCH FOR LINGERING SLICK SPOTS ON ROADWAYS, ESPECIALLY ON BRIDGES AND OVERPASSES FOR THE MORNING COMMUTE. IN ADDITION, DOWNED TREES AND POWERLINES WILL CONTINUE TO BE A CONCERN THIS MORNING. AFTER A BRIEF LULL IN WINTRY PRECIPITATION LATER THIS MORNING THROUGH MIDDAY, ANOTHER ROUND OF LIGHT SNOW AND LINGERING FREEZING DRIZZLE IS EXPECTED THROUGH THE AFTERNOON AND EARLY EVENING. SNOW ACCUMULATIONS ARE EXPECTED TO BE A DUSTING TO A HALF AN INCH, MAINLY ON GRASSY AND ELEVATED SURFACES AS TEMPERATURES SHOULD REMAIN JUST ABOVE FREEZING. THE BEST CHANCES FOR AMOUNTS AROUND A HALF AN INCH WOULD BE IN THE BLUEGRASS REGION OF CENTRAL KENTUCKY. IN ADDITION, THE EVENING COMMUTE MAY SEE A FEW SLICK SPOTS. LITTLE TO NO ADDITIONAL ICE ACCUMULATION IS EXPECTED FROM THE LINGERING FREEZING DRIZZLE. * WHAT...SIGNIFICANT ICING. SNOW EXPECTED. ADDITIONAL SNOW ACCUMULATIONS OF UP TO ONE INCH AND ICE ACCUMULATIONS OF UP TO ONE QUARTER OF AN INCH. TOTAL SNOW ACCUMULATIONS OF UP TO ONE INCH EXPECTED. * WHERE...PORTIONS OF CENTRAL, EAST CENTRAL, SOUTH CENTRAL, SOUTHEAST, SOUTHWEST AND WEST CENTRAL INDIANA. * WHEN...FOR THE ICE STORM WARNING, UNTIL NOON EST TODAY. FOR THE WINTER WEATHER ADVISORY, FROM NOON TODAY TO 7 PM EST THIS EVENING. * ADDITIONAL DETAILS...PLAN ON SLIPPERY ROAD CONDITIONS. THE HAZARDOUS CONDITIONS WILL IMPACT THE MORNING OR EVENING COMMUTE. PRECAUTIONARY/PREPAREDNESS ACTIONS... AN ICE STORM WARNING MEANS SIGNIFICANT AMOUNTS OF ICE ACCUMULATION WILL MAKE TRAVEL DANGEROUS OR IMPOSSIBLE. TRAVEL IS STRONGLY DISCOURAGED. IF YOU MUST TRAVEL, KEEP AN EXTRA FLASHLIGHT, FOOD AND WATER IN YOUR VEHICLE IN CASE OF AN EMERGENCY. SNAPPED POWER LINES AND FALLING TREE BRANCHES ARE ALSO POSSIBLE. A WINTER WEATHER ADVISORY MEANS THAT PERIODS OF SNOW, SLEET OR FREEZING RAIN WILL CAUSE TRAVEL DIFFICULTIES. EXPECT SLIPPERY ROADS AND LIMITED VISIBILITIES, AND USE CAUTION WHILE DRIVING. [8:55 P.M.] ISP reporting multiple crashes on area roadways due to the ice. Roads are getting bad and will only get worse as the night goes on. * WHAT...A MIX OF RAIN, FREEZING RAIN, AND SNOW WILL CONTINUE TO MOVE NORTH THROUGH THE AREA THIS EVENING. ACCUMULATION OF A FEW HUNDRETHS OF INCH OF ICE PER HOUR CAN BE EXPECTED FOR 1 TO 3 HOURS AS THE FREEZING RAIN MOVES THROUGH. * WHERE...THE GREATEST AMOUNT OF FREEZING RAIN IS EXPECTED ALONG AND NORTH OF THE WESTERN KENTUCKY/BLUEGRASS PARKWAYS. TEMPERATURES WERE VERY SLOWLY WARMING FROM THE SOUTH AND WILL CONTINUE TO DO SON OVERNIGHT. SNOW AMOUNTS ARE EXPECTED TO TOP OUT AROUND 1 INCH IN SOUTHERN INDIANA. * WHEN...UNTIL 6 AM EST /5 AM CST/ THURSDAY. * ADDITIONAL DETAILS...ICE ACCUMULATION WILL BE GREATEST ON ELEVATED AND EXPOSED SURFACES, SUCH AS TREES, POWER LINES, AND ELEVATED DECKS AND SIDEWALKS. SURFACE TEMPERATURES WILL WARM TO ABOVE FREEZING BY DAYBREAK THURSDAY IN MOST LOCATIONS. IF YOU MUST TRAVEL THIS EVENING, DRIVE DEFENSIVELY, LEAVING ADDITIONAL SPACE BETWEEN YOU AND OTHER VEHICLES. BETTER YET, IF YOU CAN WAIT UNTIL TOMORROW TO TRAVEL, DO SO. TRAVEL CONDITIONS WILL BE CONSIDERABLY BETTER IN THE MORNING. ...LIGHT FREEZING RAIN CAUSING TRAVEL PROBLEMS IN CENTRAL KY... .A LARGE AREA OF LIGHT FREEZING RAIN MOVING THROUGH CENTRAL KENTUCKY WILL CONTINUE TO CAUSE TRAVEL PROBLEMS THROUGH THE EVENING. WHILE ICE ACCUMULATION HAS BEEN MINIMAL IN MOST AREAS, SLICK SPOTS ON ROADS HAVE CAUSED NUMEROUS ACCIDENTS. THE KENTUCKY TRANSPORTATION CABINET REPORTS THAT I-265 NORTHBOUND IN LOUISVILLE IS CURRENTLY BLOCKED DUE TO MULTIPLE CRASHES. POWER OUTAGES AFFECTING NEARLY 800 CUSTOMERS WERE REPORTED IN BUTLER COUNTY, WHERE TEMPERATURE WERE JUST STARTING TO RISE ABOVE FREEZING. [7:20 P.M.] INDOT crews will be out on state roads overnight treating any slick spots that may form. Be sure to give the trucks plenty of room to work and slow down out there. Because the system was supposed to start as rain, crews did not think they could pre-treat as rain would wash the brine or salt away before the ice formed so don't expect roads to be treated in the near future until crews get out there. Reports to the National Weather Service of heavy sleet in Oakland City and Princeton. Also snow reports along the Ohio River. All moving northward. Snow totals may be held to 1-3 inches with addition of mix of sleet / freezing rain. Freezing rain total forecast .10-.25 inch. Less traveled roads should become slick as the night progresses. State Highways should remain wet with salt and road treatment. Bridges and overpasses could become slick as temps continue to drop. Morning roads conditions could be slick, please allow extra time and slow down. 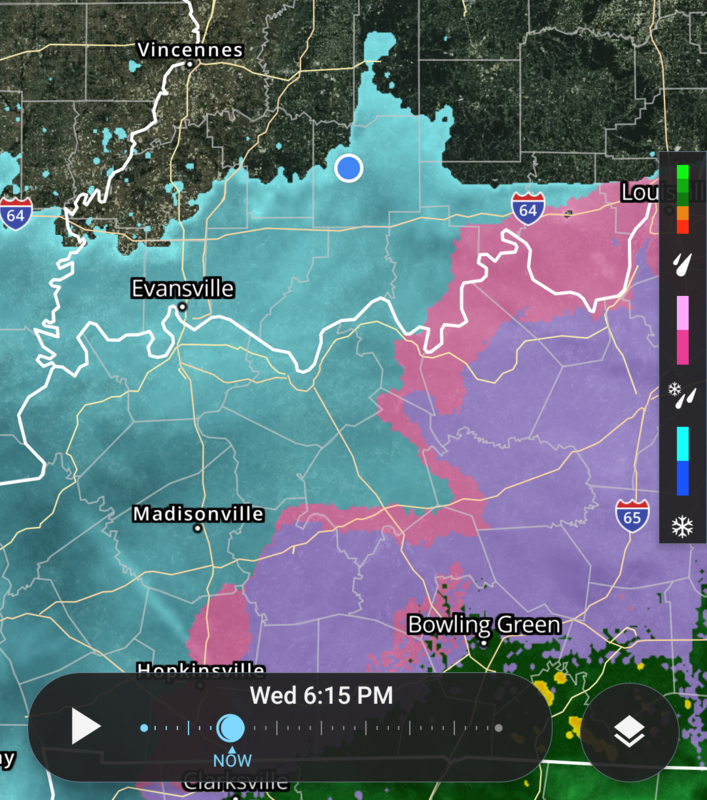 [6:50 p.m.] Basically, the sleet has begun all across the area. In Sulphur, a listener reports the ground is already getting covered with ice. Roads will begin to get slick from now through the overnight hours. [6:44 P.M.] Listener Felicia O. reports sleet in Birdseye and Shelby C. says the sleet has begun in Bretzville! Conditions will begin to deteriorate as the evening progresses. [6:41 P.M.] Listener Brittany M. is reporting sleet on the south end of Jasper. Still waiting for it to begin on the north end but should be any time now. [6:31 P.M.] A WINTER WEATHER ADVISORY goes into effect at 7:00 p.m. The precipitation is moving in as we speak. Our Melanie Arehart reports sleet in Holland. The system is moving in faster than anticipated and it's not starting as all rain, as meteorologists had expected. We'll have to see how these changes impact our final snow / ice totals. We are still expecting less than an inch of snow and up to a tenth of an inch of ice. Roads will get slick.